The North British Distillery is one of Scotland’s oldest and largest Scotch grain whisky producers. We are a distillation and maturation company selling grain spirit – the base for blended whisky – and its by-products. The legal definition of Scotch grain whisky states that it may only be manufactured from four ingredients: water, malted barley, whole cereals and yeast. It must also be matured in Scotland in an oak cask of less than 700 litres capacity, for a minimum of three years. Almost our entire production of North British grain whisky spirit is sold to customers for blending purposes. Quantities of North British grain whisky are included in many well-known blended brands. Our main warehousing complex is situated at Muirhall, approximately 20 miles west of Edinburgh. The spirit arrives at Muirhall from Edinburgh in road tankers, and is pumped into spirit vats. The first warehouse was built there in 1963, and the site now has capacity for approximately 130 million litres of alcohol, using steel racking or pallets for cask storage. In 1888, the first full year of production at North British, the company produced one and a half million gallons of proof spirit. Now, over 130 years later, we can produce that volume in just five weeks! Manufacturing whisky means we are bound by various forms of legislation. 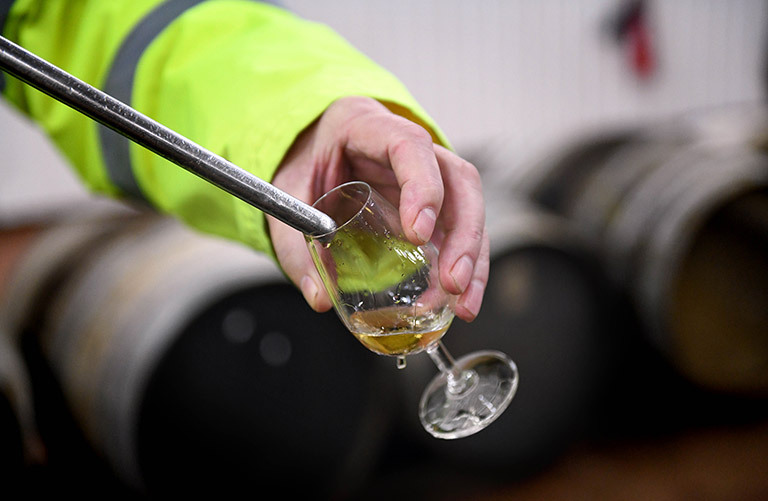 We are strictly regulated by key bodies such as HMRC, HSE and SEPA, and we carry out multiple laboratory and sensory evaluations of all spirit produced. North British is also certified to ISO 9001 (Quality Management System), FEMAS (Feed Materials Assurance Scheme) and FSSC 22000 (Food Safety System Certification) and is an Investors in People recognised organisation. All the solid and the majority of the liquid residues from the grain whisky process create a high quality, natural food for farm animals. 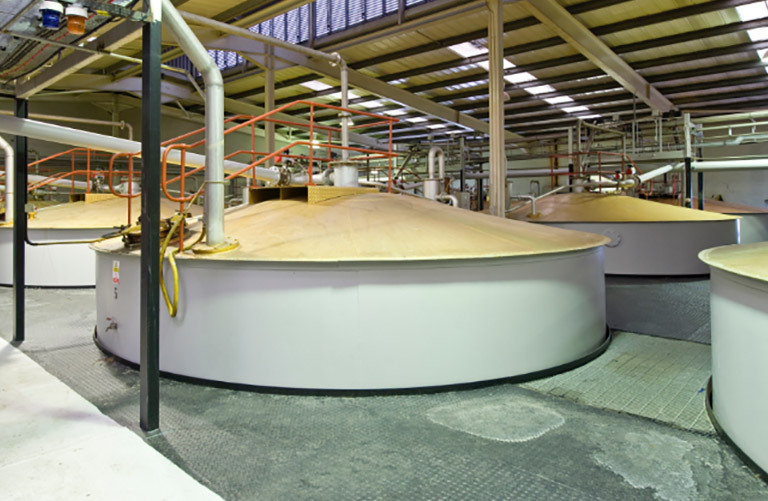 At full capacity, the plant can produce 50,000 tonnes per year of Distillers Dark Grains – a mixture of the solids separated after the mashing stage, smaller particles of solids separated from the spent wash after distillation, and a syrup, also produced from the separated spent wash. The dark grains are compressed and extruded through a machine to create small pellets, which are easier to store and handle, and easier for the animal to eat – like eating bread instead of flour! Some of the liquid residues from the grain whisky process are converted into biogas in an Anaerobic Digestion plant. The biogas, which contains up to 70% methane, fuels a gas engine which drives an alternator that generates up to 450kW of electricity. All electricity generated is used on site. The average home uses between 8.5 and 10 kWh per day. North British can generate up to 10,800kWh per day therefore suppling between 1,000 and 1,270 homes. 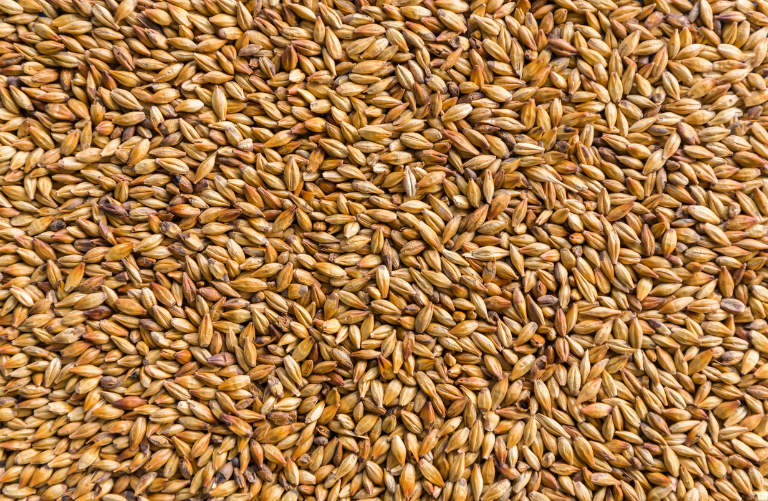 Malting is the process of encouraging barley to germinate. The barley is steeped in water to increase its moisture content to over 40%. The barley is then transferred to a malting box, where the controlled conditions of moisture and temperature allow it to germinate - a process normally taking five to six days. During germination, barley produces large amounts of enzymes - natural chemicals used by the seed to convert starch into sugar. The barley begins to grow, and small rootlets appear. At this stage, the grain is called green malt. As well as malted barley, whole cereals such as maize or wheat are used in the production of grain whisky. Cereals are selected for their starch content, normally in the range of 65% to 70%. At full capacity, the distillery uses around 3,000 tonnes of cereal per week in addition to green malt. Because the enzymes in the green malt can only work on dissolved materials, cooking the cereal is essential to the starch and makes it soluble in water. To reduce cooking times, the cereal is cooked under pressure. The cooker is filled with water and milled cereal. Steam is injected directly into the mixture, and the pressure and temperature rise to 4.3 bar / about 150°C respectively. The mixture is held under these conditions for about 30 minutes. Finally, the cooked cereal, which resembles a thick porridge, is discharged under its own pressure to a holding vessel. The mashing process converts the starch in the cereals into sugar using the natural enzymes in the green malt. The malted barley is mixed with hot water in a mash tun, to which the cooked unmalted cereals are added. The mash is complete when the temperature reaches 63°C, the optimum temperature for the conversion of starch to sugar. The sugary liquid created by the mashing process is known as wort. 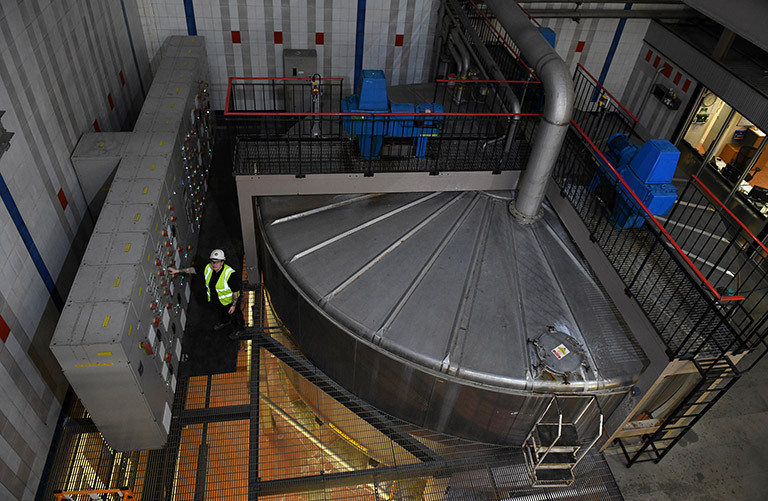 Each mash consists of 30 tonnes of cereal and about seven or eight tonnes of green malt. The wort is filtered, cooled and pumped to the next stage – fermentation. In the Tun Room, the sugar solution (wort) is fermented by yeast into a weak alcohol solution called wash – which is why the vessels in the Tun Room are called washbacks. The total capacity of the North British Tun Room is around 10 million litres. We have 24 washbacks each of 200,000 litre capacity, plus 14 washbacks each of 400,000 litre capacity. Before use, each washback is sterilised. Fermentation lasts for at least 72 hours; at the end of that time, the alcohol concentration in the wash is about 8%. 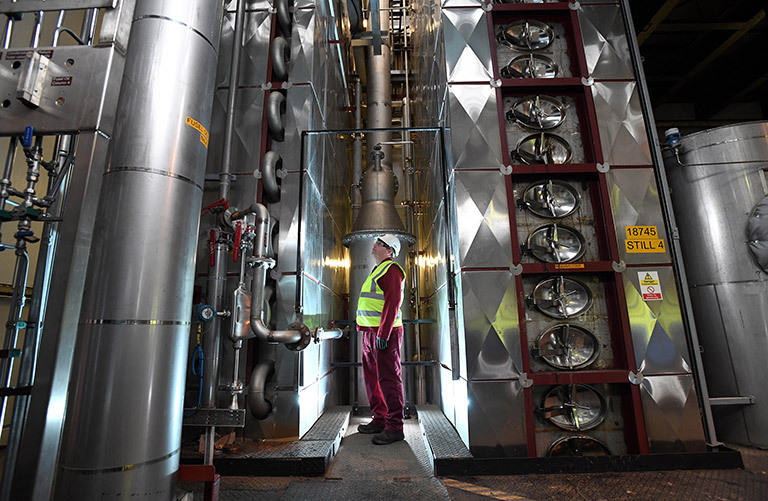 Carbon dioxide gas (CO2) produced during fermentation is routed to the CO2 recovery plant for processing. Grain spirit is distilled in a Patent or Coffey still, each made up of an analyser and a rectifier. 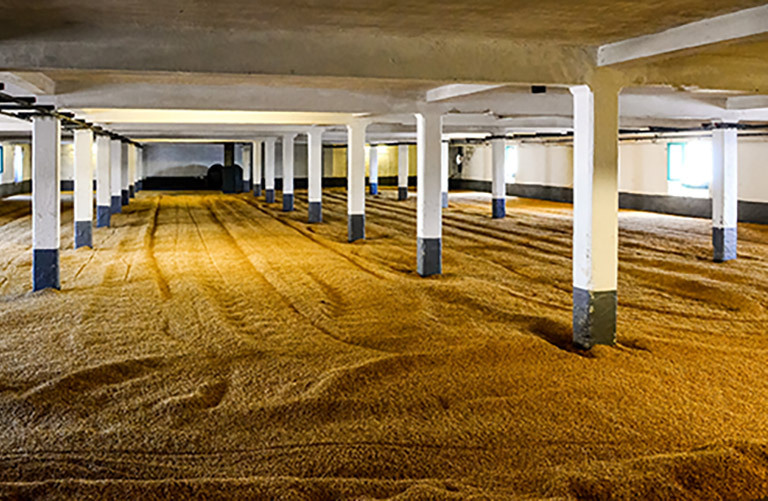 Unlike malt whisky, which is produced in batches, the production process for grain spirit is continuous. Four stills give us the capacity to produce the equivalent of 500 bottles of spirit per minute. Grain spirit is extracted from the still at a strength of 94.5%. For spirit to qualify for the title of Scotch whisky, it must be matured for at least three years in an oak cask, in Scotland. The spirit arrives from Edinburgh to Muirhall in a road tanker at a strength of 94.5%. 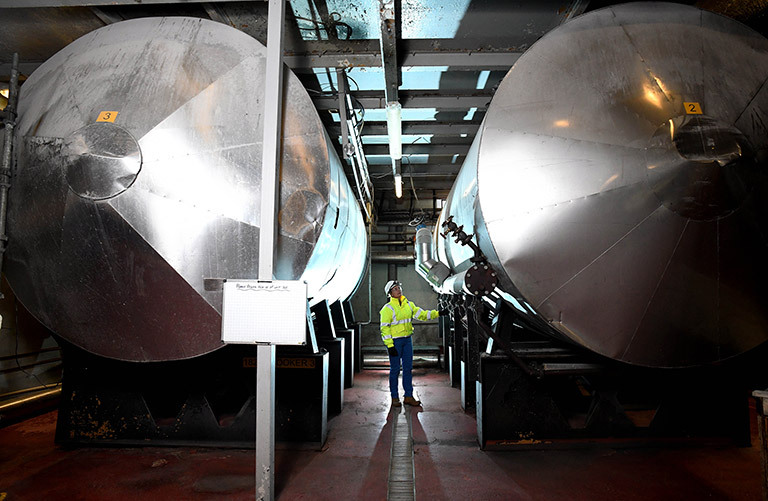 It is pumped into reducing vats, where demineralised water is added to reduce the strength to a customer specification before being filled into casks. Evaporation losses – poetically called The Angels’ Share – amount to around 2% per year. As the spirit matures in cask, it mellows and develops further flavour characteristics, along with its distinctive colour.